Browning's throwing shoulder was injured against Arizona State in November. 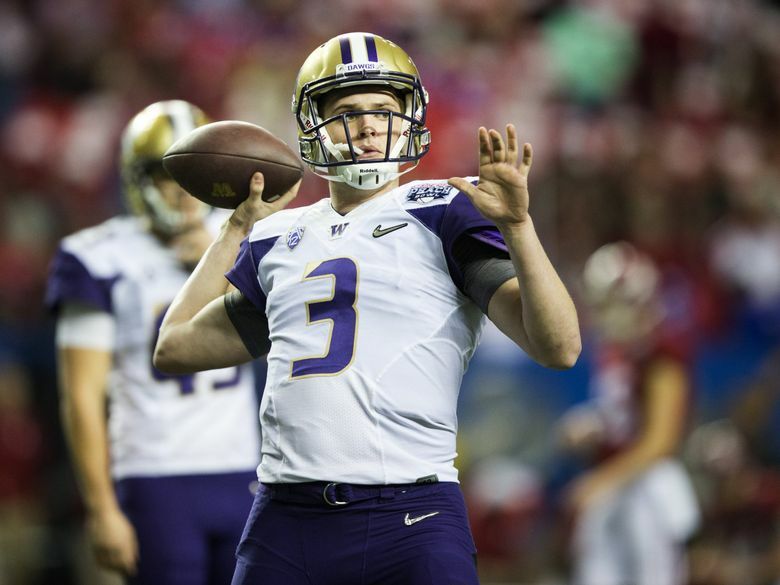 Washington quarterback Jake Browning has had surgery on his throwing shoulder, nearly two months after injuring his right arm during a November game, multiple sources told The Seattle Times. Browning’s recovery time is expected to be about six weeks. The exact nature of the injury is unclear. His shoulder was injured during the Huskies’ 44-18 victory over Arizona State on Nov. 19, an injury UW coaches kept hidden as the Huskies made their first College Football Playoff berth last month. As a general rule, Washington coach Chris Petersen doesn’t talk about injuries, and UW wanted to keep Browning’s shoulder issues concealed so as not to expose the star quarterback to more potential risk from opposing defenses, a source said. The injury adds context to some of Browning’s struggles late in the season. Through nine games, the sophomore from Folsom, Calif., had a 202.79 quarterback rating, which was on pace to break Russell Wilson’s 2011 NCAA single-season record. His QB rating was 161.82 over the final five games of the season (which included a loss to USC, a week before the shoulder injury against Arizona State). A week after the Arizona State game, Browning was sharp early on in the Huskies’ Apple Cup blowout of Washington State, completing 21-of-29 passes for 292 yards and three touchdowns. But six days later in the Pac-12 championship game, he had statistically the worst game of his career, completing 9-of-24 passes for 118 yards and two TDs in a 41-10 victory over No. 9 Colorado. Against Alabama’s top-ranked defense in the College Football Playoff, Browning was 20-for-38 for 150 yards with one TD and two interceptions. As a true freshman in 2015, Browning sat out the Huskies’ game at Stanford with an injury to his right shoulder, deemed relatively minor at the time. Browning had one of the best seasons by a quarterback in Husky history in 2016, tying the Pac-12 Conference with 43 touchdown passes and finishing sixth in the Heisman Trophy voting. His 3,430 passing yards were second-most in a season in program history, and his passer rating of 167.52 was a school record.